Lizzy’s Literary Life celebrates the pleasures of a 21st century bookworm. In her literary blog, she combines her book reviews and interviews with “Challenge Lists” of books in creative and fun line ups. Her broad taste, revealed in a wide range of reading experiences, informs the balanced tone of her pieces. Her intelligent and clear logic gives you a way in to almost any book, past or present. Her interviews are always well rounded and welcoming. There is a tradition of offering refreshments of choice to the author being interviewed, and when you read the Q&A you might feel as if you had been invited to pop by for a cup of tea and a scone with them, and overhear the lively conversation at the table. Having decided that ‘the Musings of a Middle-Aged Maniac’ “wouldn’t catch on” Lizzy took on the Pre-Raphaelite blogging persona of Lizzy Siddal. The blog started as an online note book when she lost a real one containing three years' worth of reading notes. Two years later, the blog is taking on a life of its own, her To-Be-Read mountains line up like the Alps and, in real life she now answers to Lizzy. 'Lizzy's Literary Life' is an easy place to hang out, share your reading opinions and be inspired to read more widely than you would have thought possible in an average life. But then again, she was Rossetti's muse. "Who would have thought it? I'm completely lost for words!" To visit Lizzy's blog, Lizzy's Literary Life, click here. Change in the award: We are switching to every quarter instead of monthly to make sure the award stays a rare accolade! 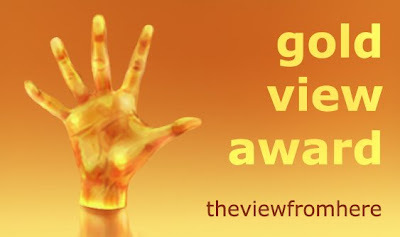 Notes on the Award: The Gold View Award is awarded by the magazine every three months. It is not a "chain" award, that is, it cannot be passed by those receiving it onto others. We award it to sites that we feel go the extra mile - either in their look, content or we just think they are amazing. In other words gold! They don't have to be literary, but most probably will be. Congratulations Lizzy's Literary Life! I do like a nice cream tea with an author interview. A lovely discovery! I'm bookmarking you. Too often I read whatever's closest to hand. A habit I've long sworn to change.